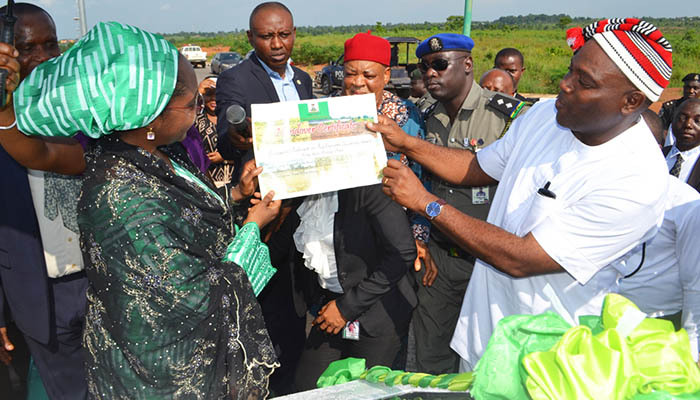 President Muhammadu Buhari has pledged to complete all abandoned federal government funded projects in Alex Ekwueme Federal University Ndufu-Alike, Ebonyi State. The President made this known yesterday, when he commissioned some ecological challenges projects initiated and completed by his administration in the university. Represented by the Minister of State for Budget and National Planning, Hajiya Zainab Ahmed, he noted that the federal government was poised to ensure that all sections and states of the federation irrespective of political lining and ethnicity benefits from its numerous developmental projects. “The completion of this ecological project in Alex Ekwueme Federal University is a testimony that every part of this country irrespective of its political lining and ethnicity will benefit from the numerous projects of the federal government”, he stated. He further commended the Management of the University for its vision of building a green and beautiful campus, noting that the institution’s environment was a beauty to behold. He also used the opportunity to support the Campus-Green Initiative of the University geared towards making it the greenest and eco-friendly campus in Nigeria by planting a tree in commemoration of his visit. Welcoming the President to the university, the Vice-Chancellor, Professor Chinedum Nwajiuba, noted that the visit would remain a milestone in the history of the University, adding that the commissioning of the erosion and flood control works, which encompassed culverts, drainages, asphalt roads and solar-powered street lights was a good gesture from the federal government and a first of its kind in the history of the University. He thanked the government for ensuring that the contactor delivered a quality work and on schedule, adding that all contacts initiated by the present federal government in the university have all been executed. “These roads are the first set of asphalt roads to be constructed and commissioned in this university since its inception 7 years ago. We shall remain eternally grateful to Mr. President for approving and funding this project and the Ecological Fund Office in the Office of the Secretary to the Government of the Federation for ensuring that it was completed on schedule”, the Vice-Chancellor stated. He appealed to the federal government to help the university get contractors awarded works in the university since 2012 to do the work they have been paid to do, stressing that the male hostel, main library and the main administrative block that started since 2012 were yet to be completed. The Vice-Chancellor also stressed that the university was building the greenest and most beautiful campus in Nigeria, adding that the Campus Green Initiative has led to the planting of over 3,000 trees, flowers and shrubs in the campus, thereby contributing to climate change adaptation and mitigation. 0 Response to "Finally Buhari Pledges To Complete Abandoned Projects in AE-FUNAI University"